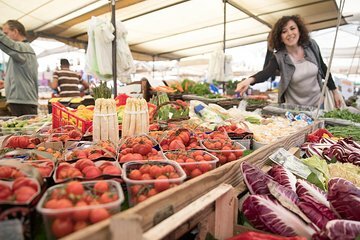 Visit 3 food enclaves—including Campo de’ Fiori and Trastevere—with no more than 12 people. A very nice guide showed us some hidden pearls for us such as small shops with meats and cheese for the romans. Also very social tour with other tourists. Loved the tour. Would highly recommended it. Went to enough places to sample different dishes. Was a fun evening. This tour took us to places we would never have found on our own, and introduced us to numerous local delicacies. It was a real treat for us! Alessandra was our guide, and she did a great job of keeping our group together, pointing out items of interest, and helping to immerse us in the local area. There were 19 of us signed up for this tour, and they split us into 2 groups - which was just the right size. All the food we tasted was absolutely delicious, and locally authentic. We just wish we had more time the next day to find some of these places again - but that will have to wait for the next trip. All in all, we thought this tour was very good value for the price. This tour made us very happy!!! It's the first time for us to join food tours. It was quite fun to eat around Rome with people who also have the similar hobby of eating. Our tour guide was very passionate about her work, so it made the tour very enjoyable. She explained to us about the restaurants and different kinds of food, etc. She even sent us recommendations after our tour! She really cares. The food we had were delicious as well. I would highly recommend this tour. The tour was well paced and the food was delicious and filling without being too much. Our tour guide was informative and had her finger on the pulse of roman culinary knowledge. I wanted to learn the recipes of many of the dishes that we ate and our guide offered to email them but unfortunately I have not recieved them but it does not take away from this enjoyable eating and walking experience. Our group first went to a family-owned bakery best known for panetoni. They make Roman style pizza(rectangular rather than round). The two we had were a potato and cheese, and margarita. The next stop in the Jewish quarter served us Roman rice balls and stuffed zucchini blossoms. The last stop gave us mozzarella ala buffalo, then our choice of pastas with a glass of wine. All were excellent, and our guide was very knowledgeable and friendly. Highly recommend. This was a great tour! Valeria was a great guide and we learned sooo much from her about Italian and Roman food! She also provided many interesting facts and history. We had cheese/meets, traditional pizza, risotto balls, deep fried cheese stuffed zucchini blossoms, pasta, and gelato! We learned a ton about the different kinds of cheeses and how they are very regional throughout Italy. The day after the tour Valeria emailed us a list of restaurant recommendations in Rome and all over ItalyFlorence, Siena, Amalfi Coast etc! She was a fabulous guide and her email was so helpful for the remainder of our visit! We would do this tour again! Met our guide Valaria near Camp de' Fiori who then led us to that market where she explained the market's operations, the various types of produce and it's origins if not grown in Italy, it's country of origin must be noted and the various types of vendors. Then the eating began...pizza from a forno oven, fried stuffed zucchini and fried rice balls, cheeses, salamis and gelato. All this as we walked through Trastevere and the Jewish Ghetto. Valaria was an incredible tour guide. Have already recommended this tour to friends headed to Rome. We had a great time, tour guide was outstanding and did a fantastic job. So glad we got her and will always remember this experience. Every where she brought us to had a delicious surprise waiting for us. Thoroughly enjoyed her knowledgeable commentary on both food and sites throughout the tour.